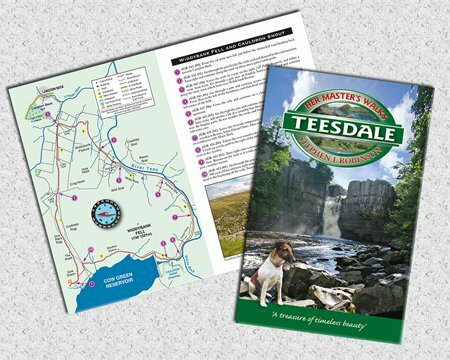 Teesdale is a superb place for walkers, especially those who enjoy wilder, secluded areas. The extensive network of footpaths and bridleways offer an excellent choice of routes from easy riverside rambles to strenuous fell walks. It is often called the most northerly of the Yorkshire Dales and, until 1974, the river Tees did mark the boundary between the North Riding of Yorkshire and County Durham. Large parts of Teesdale fall within the North Pennines AONB - the second largest Area of Outstanding Natural Beauty in England and Wales. It is also designated as a UNESCO Global Geopark - establishing its important Earth heritage. The river Tees rises at Tees Head on the slopes of Cross Fell, which is the highest point on the Pennine ridge. For much of its course, the river is shadowed by the Teesdale Way a 92 mile (147 km) long-distance path starting from Dufton in Cumbria and passing through County Durham and Teesside to reach coastline of the North Sea coast at South Gare near Redcar. The spectacular scenery of Teesdale attracted many of the great landscape painters including John Sell Cotman and J. M. W. Turner. Sir Walter Scott was a frequent visitor to the area which inspired his epic poem Rokeby. Charles Dickens also came here in 1838 to gather material for his novel Nicholas Nickleby. You can, with a little effort, follow in their footsteps and see this beautiful valley which they have immortalised! Each walk has a two-page description, a colour map with numbered arrow pointers and route directions with grid references to aid map reading. All of the walks follow circular routes ranging from 6 to 8.25 miles (9.6 to 13.25km).